The New Orleans Jazz and Heritage Festival is a two week event in late April and early May that celebrates the music, food and cultural heritage of the Crescent City. You expect the music to be great (see the calendar for details). The bonus is that the fest also has scores of vegetarian dining options conveniently marked by an asterisk for your meatless dining convenience. Much like New Orleans, the food at Jazz Fest is a melting pot. There is Cajun fare and Creole cooking in addition to food from other parts of the U.S., Italy, the Mediterranean, the Caribbean and Japan. Most of the vendors are from the New Orleans area. Jazz Fest provides a tremendous opportunity to try a little bit of everything in the Big Easy. When paired with a great soundtrack, it's a winning combination. Red beans and rice is about as New Orleans as a dish can get. It's at least as New Orleans as gumbo, jambalaya, andouille sausage, muffulettas and po' boys. Unfortunately, carnivores often up the flavor of their R-B-R with ham hocks, sausage or bacon. Luckily, Burks & Douglas prepares a vegetarian red beans and rice that packs all of the flavor with none of the guilt. Ya ka mein (pronounced yock-uh-mean) is a dish of indeterminate origins with a flavor that is 100 percent New Orleans. Ostensibly, ya ka mein was introduced to New Orleans by Chinese port workers, and it was later adopted by the African American community. It is sometimes called old sober because it is utilized as a hangover cure. Miss Linda's catering makes a vegetarian ya ka mein (ya ka mein is typically a beef soup). Vegans be warned: it does contain a hard boiled egg. The hot soup has a mushroom broth base turned up by soy sauce and hot sauce, then filled with spaghetti noodles, broccoli, cauliflower, carrots, scallions and of course the hard boiled egg. You don't have to know who created ya ka mein to know that this one tastes delicious. Bennachin is an African restaurant in New Orleans that specializes in the cuisine of Cameroon and Gambia. The vegetarian combo plate that they serve comes with jama jama (sauteed spinach) and fried plantains. The spinach is prepared with onions, garlic and hot peppers. It is soft and satisfying. The plantains are soft and thickly breaded. The savory spinach pairs well with the sweet plantains. Mona's Cafe is a small Mediterranean chain in New Orleans. Like most Mediterranean places, Mona's features many vegetarian choices. The combo platter comes with falafel, hummus, tabouli and a Greek salad. While the food was tasty, it was definitely a pain to eat salad at Jazz Fest while the sand and wind are whipping you in the face. Unlike myself, I would recommend taking shelter before engaging this dish or you will end up coating yourself and those who surround you with lettuce, dressing and feta cheese. DiMartino's Muffuletta's makes a vegetarian muffuletta that is absolutely killer. The thick, sesame seed sandwich roll is stuffed with Swiss cheese and covered in an olive salad with red peppers, yellow peppers, mushrooms, green olives, spices and olive oil. Flavor explodes from the olive salad, and it's so good that there are no condiments required. One of the other New Orleans specialties that was on display at Jazz Fest was the Snoball. If you ask for a Snow cone, a vendor will assume that you are a stupid Yankee and spit in your dessert. Plum Street Snoballs had stands set up all around Jazz Fest. I sampled the chocolate snoball with an extra dollop of condensed milk, which adds both sweetness and richness. It is a great cure for the blazing hot sun (or whatever else ails you). There were many other vegetarian eats available at the fest that I didn't get a chance to sample. Other options include fried green tomatoes, corn on the cob, spinach artichoke casserole, fried eggplant in marinara, broccoli cheese pie, seaweed salad, Tunisian salad, Jamaican steamed vegetables, grilled veggie pitas and gelato from La Divina Gelateria. 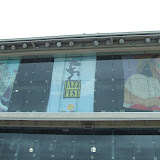 I will have to wait for another time and another forum to extol the music I saw at Jazz Fest. You can see some of the music I caught in the slide show below. However, the food alone makes the Jazz and Heritage Festival a destination all by itself.